Unique Fashions pageant dresses for babies, toddlers and young girls are beautiful and age-appropriate options for the youngest pageant competitors. No matter how old your little girl may be, these high quality formal dresses come in sizes that will fit her perfectly and make her look truly beautiful come pageant day. Whether it's her first pageant or she's already quite experienced in the world of children's pageants, Pageant Designs offers Unique Fashions pageant dresses in sizes for babies all the way to girls' sizes 4 through 12. 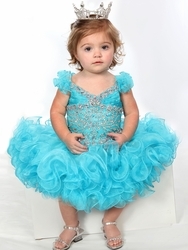 Our baby pageant dresses come in bright, fun colors with rows of sequins and other sparkling details, and they feature very flared, tutu-style skirts that look adorable on a small baby. Toddler pageant dresses from Unique Fashions also feature ballerina-inspired skirts with layers of tulle, and their puffy sleeves or off-the-shoulder necklines create a look worthy of a fairy princess. 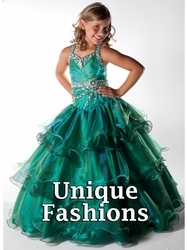 For older girls, Unique Fashions pageant dresses come in long lengths with bell-shaped skirts and slim-fitting bodices in your choice of bright, bold colors that promise to catch the judges' eyes. While they are designed especially to adhere to pageant rules and guidelines, these Unique Fashions pageant dresses are still incredibly unique.